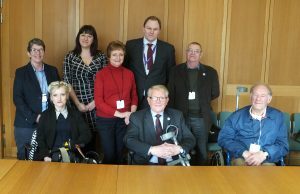 Members of STAND visited Parliament to talk to our MPs about access issues. Access to the North Staffs Justice Centre which is being used for PIP appeals has been the topic of many complaints. Gareth Snell MP and Ruth Smeeth MP and Paul Farrelly’s secretary are going to see what can be done to help. The problem of pavement parking was raised as this issue has caused members to be housebound, when people parked over their drive, members had been intimidated and abused when they asked for the offending vehicle to be moved and also vehicles had damaged fences as they had been driven onto the pavement. Members driving disabled buggies had been forced into the road when vehicles had been inconsiderately parked on the pavement. The last issue we raised was the fantastic progress of the Blue Iris project to combat loneliness. Our sincere thanks to everyone who has contributed to the success of this project.